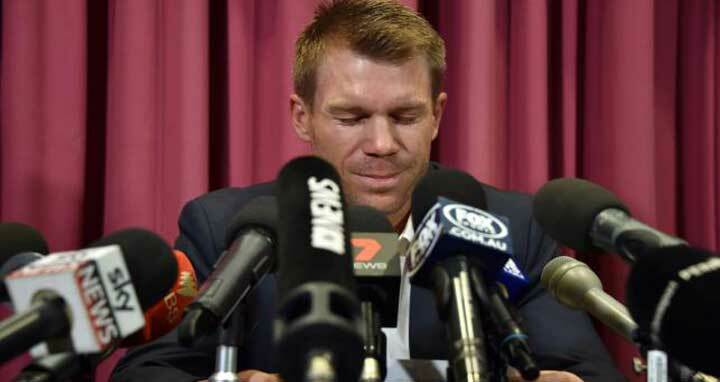 Dhaka, 31 Mar, Abnews: Former Australia vice-captain David Warner apologised in tears Saturday for his role in ball-tampering but said he may appeal his 12-month ban in the latest emotional public appearance over the scandal. A sobbing Warner said he realised he may never play for his country again. But he stonewalled questions about who was aware of the plot and whether it was the first such incident within the team. Warner, 31, told a media conference in Sydney: “I can honestly say I have only wanted to bring glory to my country through playing cricket. Warner’s appearance comes after similar heartfelt apologies by opening batsman Cameron Bancroft and captain Steve Smith, who broke down when he faced the media on Thursday. Coach Darren Lehmann, convinced to step down after seeing the apologies from Bancroft and Smith, was also tearful as he announced his resignation. Smith and Warner were banned from international and domestic cricket for a year and Bancroft was suspended for nine months after the incident during the third Test in Cape Town. Bancroft was caught on camera trying to use yellow sandpaper to alter the ball, an offence which triggered an outpouring of criticism against the hard-nosed Australian team. Warner, a dynamic batsman but a divisive figure in the game, was charged by Cricket Australia with developing the plot and telling Bancroft to carry it out. A report Saturday said Bancroft was set to lodge an appeal and had sought legal advice ahead of Thursday’s appeals deadline. Warner, who struggled to control his emotions during his 10-minute media conference, apologised to both teams, their fans, Cricket Australia and his family, including his wife Candice who was also crying as she watched from the media seats. But when asked for further details of the plot, such as whether it was his idea, who else was aware and whether it had happened before, he avoided the question. “I am here today to accept my responsibility for my part and my involvement for what happened in Cape Town,” Warner said. Warner, who has played 74 Test since his debut in 2011, said he would be seeking ways to make character changes. Warner, who has been described as the team’s “attack dog”, was also banned in 2013 after punching England’s Joe Root in a bar. “I suppose there is a tiny ray of hope that I may one day be given the privilege of playing for my country again, but I am resigned to the fact that may never happen,” he said. “But in the coming weeks and months I am going to look at what has happened and who I am as a man. The fallout from the crisis has seen Warner dumped by sponsors ASICS and LG. Along with Smith, he has also been ejected from this year’s Indian Premier League, losing contracts worth nearly US$2 million each.